June, July & September – Sunday 7-9 p.m.
August – Saturday 7-9 p.m.
All are welcome. No fee within HOA Membership – Donations appreciated. Outside Entrance Gate: Clifford Drive. Fee charged. Come early and bring your dinner fixings. Picnic area is open. BBQ's are fired up. Great Raffle Prizes at each of the 11 concerts. Be sure to buy your raffle tickets on concert night. 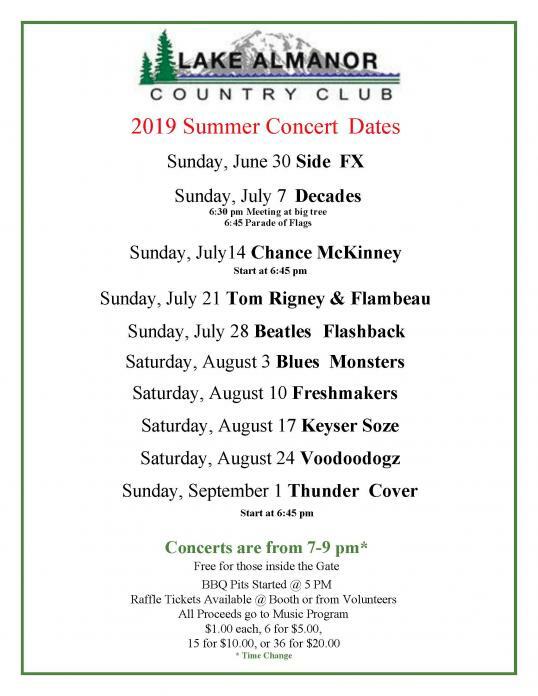 These items along with program advertising and your donations are the only supporting revenue of the annual Lake Almanor Summer Concert Series. No funds are drawn from the LACC General Fund to support the music program. Your support has kept the music playing since the late 1970’s and in the Bandshell since 1987. You are part of a great history; let’s keep it in the making. Thank You!! HELP NEEDED to sell raffle tickets & other concert duties.